Hey, Mom, does this look familiar? When I was a kid we had what I always thought were apple trees in our backyard. My grandmother visited in the late summer/fall and insisted that they were really large crabapples. To this day I don't know which they were, but once she proclaimed them crabapples, that was it. Then she made crabapple jelly. She harvested countless crabapples, made juice and then jelly. We had jars of jelly all over the house. We used washed out condiment jars sealed with paraffin when we ran out of canning jars. We were finding them years later, hidden in the storage room. I think my parents may have found some when they moved out. Today my friend, the same one who brought me the zucchini, brought me crabapples. I've seen the trees. They are the healthiest looking crabapple trees I've seen in a long time! And not on the side of a road, either. They are next to a little pond behind her apartment building. It's very nice there. I took those crabapples and trimmed them and boiled them to make juice. I ended up with a very syrupy 6 cups of juice which I diluted with water almost in half to make less syrupy. It was the perfect consistency at that point. 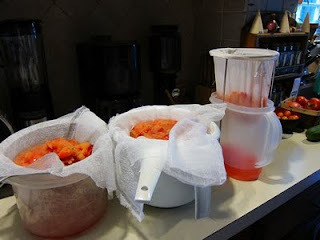 I then made one batch using the Certo recipe (5 cups juice, 7.5 cups sugar, 1 package Certo), which was just shy of 9 cups. I offered my friend some. She said, "You know, I don't really eat jams or jellies." I convinced her to take a jar anyway. The 9 year old had a glass of juice sweetened with just a little sugar and I have enough left for another batch of jelly. Which I might make tomorrow. I have to go to work tonight. But I spent the day with fond memories of my grandmother. And that's a pretty cool gift from a simple little fruit. Caught a Fish For Dinner! Yep. That's a Lot of Peaches.